Summary: Mikhail Khorev was born in to a Christian family. Not just any Christian family but one where the father was extremely strong in his faith and refused to bow to the state. When he was 8, Mikhail's father was arrested and within two years had died in prison for his faith. This left Mikhail's mother to raise her three daughters and son at an extremely difficult time as the Second World War was in progress. Through God's great goodness they were able to escape before the effects of the Siege of Leningrad claimed their lives. For the next four years the family wandered from place to place looking for a way to survive before they could finally return to their city. At 17 Mikhail finally makes his parents' faith his own as the Word of God, which he had heard all his life, sunk in and the Holy Spirit did a work in his soul. From that day forward, Mikhail's whole goal in life was to serve the Lord despite the restrictions placed on the church by the government. As the situation worsened in the churches, Mikhail became one of the leaders in urging the church to seperate from the registered churches, puppets of the state. As Mikhail travelled around the Soviet Union encouraging believers to stand firm for the Lord, he was arrested several times and served several prison sentences. Through this all, Mikhail served the Lord wherever he was, sharing with anyone he could about the love and grace of God. 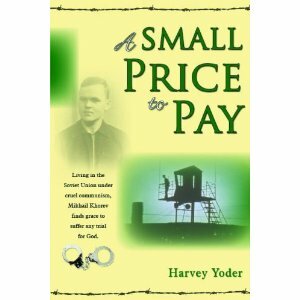 His final prison term ended in 1986 but despite being released he was placed under house arrest, restricting his ability to serve the Lord. Thus until the fall of communism, Mikhail lived in hiding but continued preaching and teaching. Message: God provides the grace to endure every trial. God answers prayer. Anything that we can give is a small price to pay for what Christ has done for us.